Figure A30. Cyprus anomaly, interpreted as the Cyprus slab, with (horizontal) [vertical] cross sections through (A)[D] the UUP07 p-wave) and (B)[D] the combined SL2013 and S40RTS s-wave models at 490 km; C) the location of the modern geological record that we interpret to have formed during the subduction of the slab. was imaged by Faccenna et al. (2006) and Biryol et al. (2011) and is interpreted as a north-dipping slab that may or may not be still attached to the African lithosphere to the south of the island of Cyprus. In the upper several hundred kilometres of the mantle, it is clearly disconnected from the Antalya slab, but in the lower part of the upper mantle, the two slabs become indistinguishable (Biryol et al., 2011). We do therefore not add a separate estimate for the age of the base of the Cyprus slab, but apply the estimate for the base of the Antalya slab of 95±5 Ma. 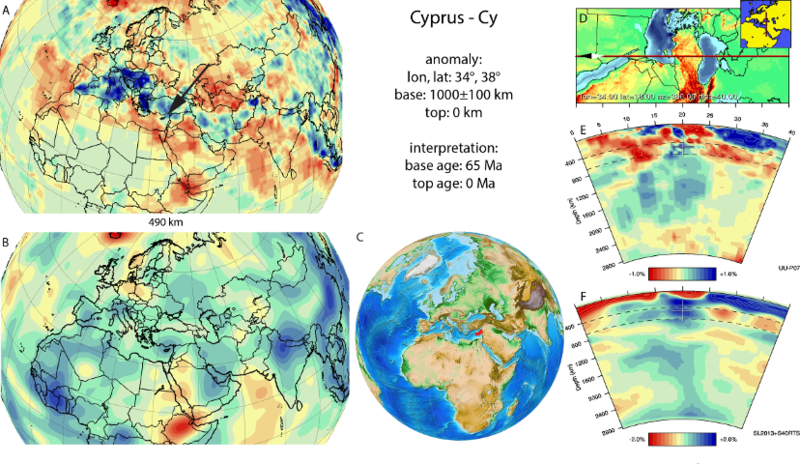 The Cyprus slab consequently likely contains oceanic lithosphere of the Izmir-Ankara ocean, continental lithosphere of the Taurides, and oceanic lithosphere that subducted after the Late Cretaceous-Eocene accretion of the Taurides. This oceanic lithosphere must have connected to the Troodos ophiolite on Cyprus that emplaced in the late Cretaceous onto continental rocks exposed in the Kyrenia range following roll-back of an original East-dipping subduction zone into the SE Mediterranean region (Moix et al., 2008; Maffione et al., 2017), whereby the Cyprus (Troodos) and Syria (Baer Bassit) ophiolites underwent large counterclockwise rotations (Morris et al., 2002). The age of obduction is best constrained by Maastrichtian sediments that unconformably cover the contact of the ophiolite with its underlying melange that contains Triassic passive margin carbonates (Swarbrick and Naylor, 1980; Bailey et al., 2000). Similar to the Bitlis slab, we suggest that the much of the Cyprus slab consists of this back-arc that formed during Late Cretaceous roll-back.